You are yet to be born, you are yet to take a life like form, you are yet to understand the humans, you are yet to understand their behavior, you are yet to have feelings, you are yet to know them, but the humans around you already have expectations, and you are yet to comprehend! What will you call this? The cruelty of life or an opportunity to shine, succeed, lead and glorify? Life is such, serving you unexpected situations, freshly brewed almost every time. The opportunities to save people and their prestige for a reason, when related to a larger community, always deserves the best of your ability to defend everything. I recently read Aryavir, first part of the Guardians Of The Blue Lotus Trilogy written by author Anita Shirodkar. The author, Anita, currently works as a consultant for an event and destination management company. Apart from writing, her interests range from world cuisine and photography to oil painting and spirituality. This is Anita's fourth book while the previous three were Secrets and Second Chances, Nights in Pink Satin and Adriana's Smile. The story of Aryavir is set in a fictional kingdom and races, having a resemblance and inspiration from ancient India. 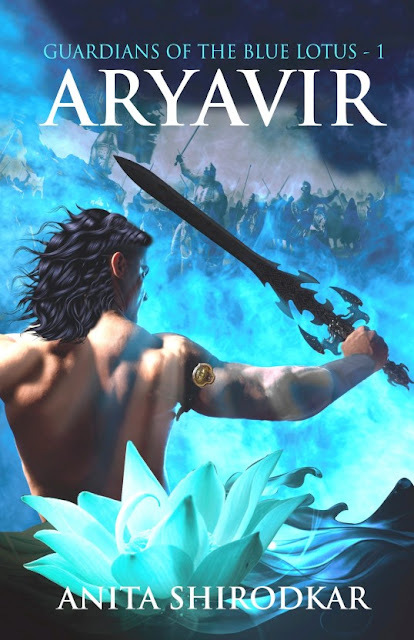 Aryavir, is the protagonist of the story and is the blue-eyed prince of the Kamalkund kingdom blessed by the Indivara, a divine blue lotus that protects Kamalkund. Aryavir is a fantasy fiction with princes, the kings, queens and the warriors who not only fight the battles, but also are a part of the three dimensional cobweb wherein everyone's fate is intertwined with one thing or the other. Overall, Aryavir is about the journey of humans from one axis to another, of different perspective and need, of indifference and ignorance, of power and determination, of victory and mysteries! There are complexities in the story, but not the writing, The metaphors are used very interestingly throughout the story, the characters apart from Aryavir are very well crafted and have meaningful roles to play. Another interesting part about the book is that, even after being fictional, nothing seems unreal. The book has illustrations, family tree diagrams for the readers to make it easy, however, I would recommend that you are reading it with full attention to avoid missing on any minute detail, though the language used is very simple and heavy and irrelevant jargon-free. The 331 page long book, Aryavir, is about varied emotions, distinct personalities, and not only war and valor! I would recommend this book to anyone interested in reading a fiction.